‘Alohilani Resort Waikiki Beach resides on land that belongs to Queen Lili’uokalani’s Trust and is named after one of her beachside cottages, meaning “heavenly brightness” or “royal light.” In honor of her legacy and a deep commitment to preserving Hawaii’s forests, ‘Alohilani has partnered with Hawaiian Legacy Reforestation Initiative (HLRI), a non-profit organization committed to returning the indigenous koa, milo and sandalwood trees back to the Hawaiian Islands. By staying at ‘Alohilani, guests can contribute to these efforts. 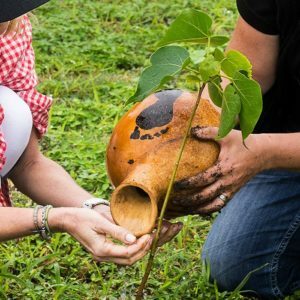 Guests are encouraged to visit HLRI’s Gunstock Ranch on Oahu’s beautiful north shore and plant their own tree. Scenic tree planting tours include horseback riding, helicopter and UTV tours. Each tree planted through HLRI is tagged with an individual radio- frequency identification chip that records everything from genetic makeup and health to the circumstances of the planting. Guests can track their tree throughout its lifetime. On the Big Island, HLRI has already planted 400,000 trees on 1,200 acres. 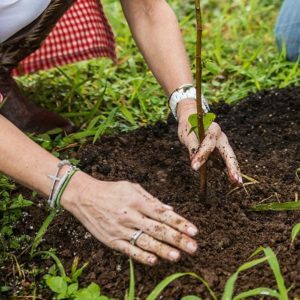 It was designated by the World Wildlife Fund as the first Gold Standard Certified Forest Carbon Credit in North America, and remains the only koa carbon credit in the world. The forest is pumping clean oxygen into the atmosphere at an astonishing rate: one koa tree alone can offset a vacation for a family of four. ‘Alohilani, with the help of their guests, has pledged to plant 100,000 trees with HLRI, helping to revive Hawaii’s endangered hardwood species and rehabilitate a native ecosystem.